The purpose of this blog post was to discuss the energy resources of Chisitu, Malawi, (and location of the Students for Malawi project) with the HOMER software. HOMER (Hybrid optimization of multiple energy resources) is a commonly used software package focusing on the system operation analysis and cost comparison of varying energy resources with the software and can be used for off-grid design. Our VIP team will use this software to help analyse the different options in Chisitu. Generation Resource Specifications: First, we are considering three energy resources for the small grid/off grid power generation system: wind, solar and diesel. The Students for Malawi project is designed to use a Hugh Piggott’s wind turbine to generate the electricity, so the analysis will have a clear benefit to the project. It is assumed that station batteries will be charged by the wind turbine and any other generation sources. The solar energy resource is high in Chisitu and is expected to be a potential choice. Although diesel is imported in Malawi, a diesel generator may a strong backup for the other renewable energy technologies; it can supply power to some during emergency, or to loads that are critical such as the maternity ward and recovery ward. Now we will initialize the program and get started with the analysis. HOMER can search for the project location and Chisitu Malawi would be the place in our case. 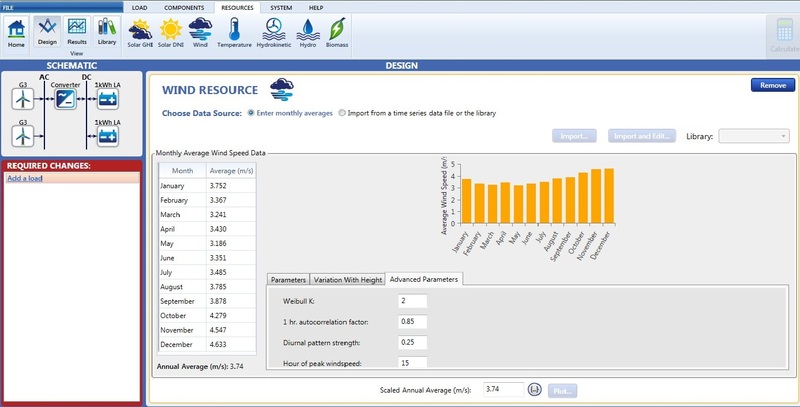 Figure 2 shows the wind resource data, a number of renewable energy resources are involved in this software. A Hybrid Power System is frequently used in Malawi and other African countries; hybrid system has combined the wind energy or solar energy with diesel generation. This combined system is more efficient if used to supply power for industrial purposes. The figure shown below is a hybrid power system example that combined with diesel generators and wind turbines. Full system analyses of this design schematic as shown in the right. 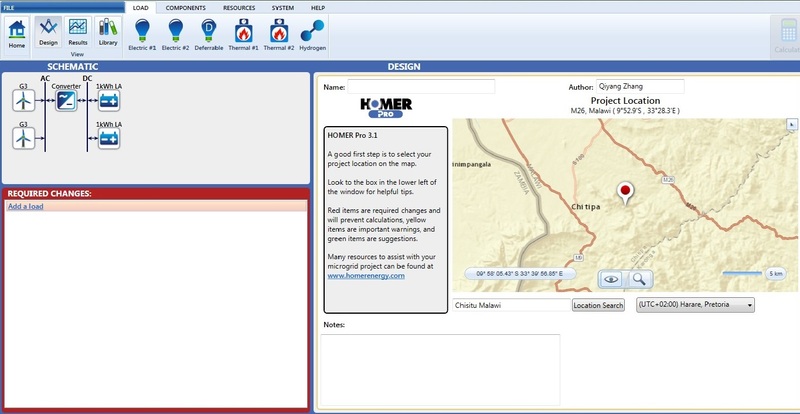 Through our initial training exercises, we found that HOMER can be easily design analyze a prospective system with the identified location and specified data. 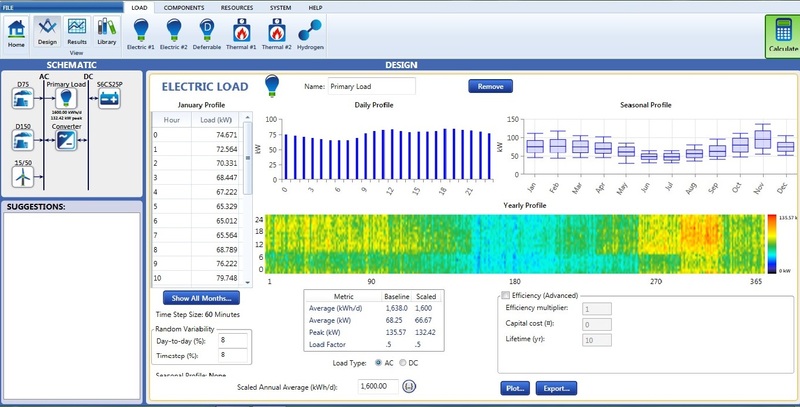 This software combines engineering aspects and economics; which makes it more efficient to simulate, optimise and analyze the sensitivity of the power system depending on what is most available and economical. The calculation feature of this software can automatically determine suitable solutions and graphs for your design. The next stage of this part of our project is to do some investigation (and maybe a few assumptions) on the resouces, costs, and systems designs so it can complete the analysis for Chisitu. Moreover, then create comparisons between them.